For the geographic valley, see Amargosa Valley. Amargosa Valley (formerly Lathrop Wells) is an unincorporated town in Nye County, in the U.S. state of Nevada. The community is named for the Amargosa River which flows through the valley from its origination in Nevada to its terminus in Death Valley, California. Like most desert rivers, the 200-mile (320 km) long Amargosa flows on the surface only when rare rainfalls flood the desert washes, except for a 20-mile (32 km) segment near Shoshone, California, where the river flows perennially. The name Amargosa Valley is used locally with reference to the actual geographic valley, although for the most part, it is coincident with the Amargosa Desert and is noted as such on many maps. The populated area of the Amargosa Valley is sandwiched between U.S. 95 to the north, and the California border to the south. Some of the residential streets in the community cross over into California. Much of the Nevada-California border in this area is contiguous with the boundaries of Death Valley National Park. The national park boundary extends into Nevada near Beatty, approximately 30 mi (48 km) northwest of Amargosa Valley. Amargosa Valley is located approximately 88 mi (142 km) northwest of Las Vegas, 35 mi (56 km) northwest of Pahrump, and 24 mi (39 km) north of Death Valley Junction, California. The Tonopah and Tidewater Railroad ran through the valley from 1906 to 1940, for borax mining operations. Modern development did not begin until the early 1950s. Electric power, other than that produced by private generators, was not available until 1963. Until the early 1990s growth in Amargosa Valley was minimal. More recently, intense growth in Las Vegas has led many new residents to settle in Amargosa Valley and nearby Pahrump. Amargosa Valley is located at 36.58001 North, 116.44487 West at an elevation of 2,640 feet (805 m) above sea level. The landscape is typical of lower to moderate elevations in the Mojave Desert, with flat expanses of sandy soil punctuated by rocky mounds and hills. Predominant indigenous vegetation is White Bursage and Creosote Bush, with some Joshua Trees and Cacti at higher elevations. Numerous non-native plant species have also been introduced. Alien Cathouse is one of Nevada's legal brothels. It is located near the corner of U.S. 95 and SR 373. Longstreet Hotel, Casino, and RV Resort is a full-service hotel and casino with restaurants and a RV park. The hotel is located on SR 373, near the Nevada–California border. The hotel is popular with visitors to nearby Death Valley National Park. Big Dunes, popular for weekenders from all over Southern Nevada, is located on the north side of Amargosa Valley. 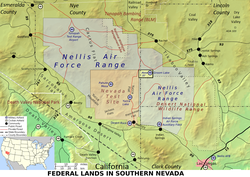 Ash Meadows Wildlife Refuge is located in the southern end of Amargosa Valley. ^ a b "Amargosa Valley". Geographic Names Information System (GNIS). United States Geological Survey. December 12, 1980. Retrieved November 7, 2009. ^ "Nye County Code - Section 18.04.010: Formation of Town". Sterling Codifiers. Archived from the original on December 25, 2016. Retrieved January 29, 2017. ^ "YouTube". www.youtube.com. Archived from the original on 16 May 2016. Retrieved 24 April 2018. ^ "Alien Cathouse offers legalized prostitution near Las Vegas". www.aliencathouse.com. Archived from the original on 15 January 2018. Retrieved 24 April 2018.